President Muhammadu Buhari entreated Nigerians on November 25 to “resist the temptation to play politics with the tragedy of the deaths of our soldiers” in the wake of withering criticisms of his reluctance to acknowledge, much less grieve, the heartrending mass slaughter of more than a hundred Nigerian military officers by Boko Haram terrorists on November 19. He—or his social media minders—fired off another tweet the same day. “It is unacceptable to ignore or minimise the deaths of Nigerian citizens because of elections. It is heart-breaking. This must change,” the tweet read. 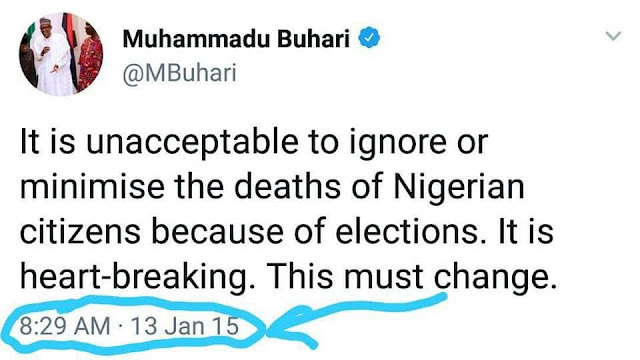 Interestingly, Buhari did precisely what he railed against in 2015: he minimized the death of our soldiers by asking us, like Jonathan did, not to "play politics" with it and by his nakedly transparent disinclination to acknowledge the tragedy until five days after the fact—as a consequence of sustained social media taunts. 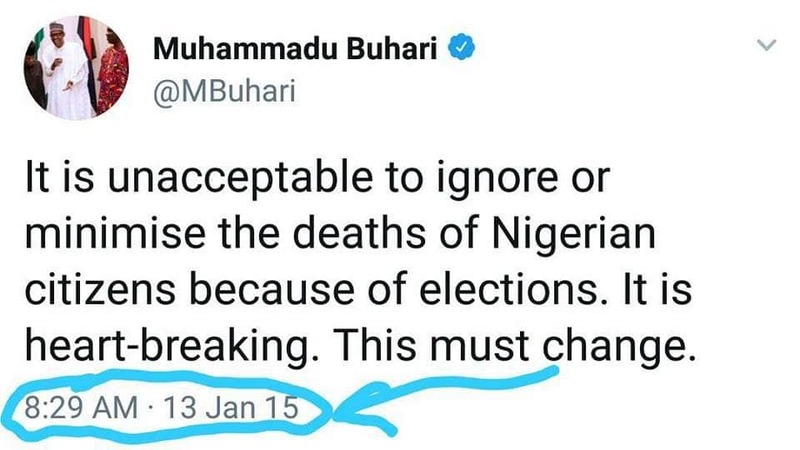 Of course, Buhari and his handlers were slow to react to the mass slaughter of our soldiers because they thought doing so would explode their self-serving propaganda that Boko Haram had been “technically defeated” or “degraded” and imperil one of the core anchors of their reelection campaign. It wasn’t only Buhari who played politics with the tragedy of Boko Haram’s mass slaughters of civilians and soldiers. Kaduna State governor Nasir El-Rufai, whom Buhari said singlehandedly prevailed on him to run for president in 2015 after he gave up hope of every winning an election, played more than “politics with the tragedy of the deaths” caused by Boko Haram during the Jonathan administration; he was downright cruel and uncommonly acerbic in his mockery of the Nigerian military. 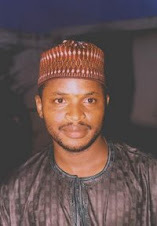 Thankfully, in spite of exaggerated claims by the Buhari government about the “politicization” of the tragedy of Boko Haram’s murder of our soldiers, no one, to my knowledge, has scornfully tagged our military as a "Buharist army," and no one has said we shouldn't support our military because they don't like the president of the country. Nor has anyone called supporters of our military "idiots." If anything, there has been a bipartisan outpouring of patriotic support for the military. 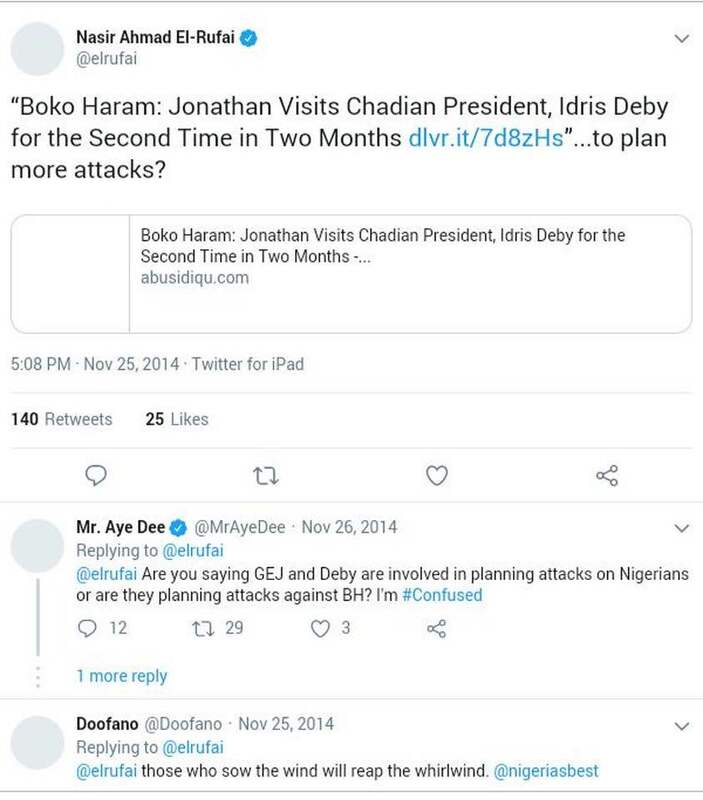 Again, when Jonathan visited Chadian president Idris Deby to strategize on how to contain Boko Haram’s unceasing homicidal fury, El-Rufai implied that the meeting was a sinister conclave to hatch plans to kill more Nigerians. In a November 25, 2015 tweet, he shared a news headline that read, “Boko Haram: Jonathan Visits Chadian President, Idris Deby for Second Time in Two Months.” Below the headline, he commented thus: “…to plan more attacks?” I am yet to find an equivalent for that sort of recklessness since news of President Buhari’s planned visit to Chad got out. In addition, Boko Haram was campaign fodder for APC. A wildly popular APC campaign video that made the social media rounds in 2015 ended with following words: "Make no mistake: the enemies [i.e., Boko Haram] are relentless. Vote for the man, Buhari, who can protect you and your children. Vote for change!" So when the Buhari administration accuses people of “playing politics” with Boko Haram, they are being willfully amnesiac and hypocritical. No one has played more politics with Boko Haram than Buhari and his enablers in APC in the build-up to the 2015 election. Even now, no one is playing more politics with Boko Haram than the government. Most importantly, though, this is isn’t the first time Boko Haram has killed soldiers on the frontlines in large numbers. 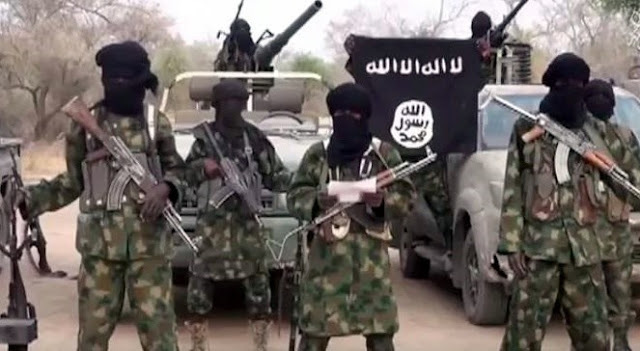 For instance, according to Premium Times reporter Nicholas Ibekwe, on July 14 this year, Boko Haram murdered more than 200 military personnel at a military facility in Jili. “Due to poor reporting that incident didn't go viral,” he said on Twitter. “Poor reporting” is obviously a cute euphemism for deliberate government suppression of negative news about Boko Haram. 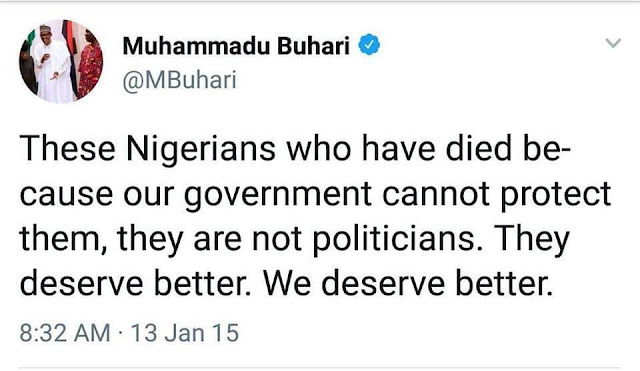 Recall that on August 2, after Boko Haram murdered, yet again, scores of soldiers, Buhari pretended it didn’t happen and instead chose to meet with senators from his party who had threatened to defect to the PDP. He was more concerned with salvaging his failing reelection bid than he was with the tragic death of soldiers who sacrificed their lives in defense of the country. Isn’t this similar to, or even worse than, Jonathan’s attitude of blithe unconcern toward the Boko Haram tragedy in 2014? As many international news organizations have noted, more soldiers have been killed by Boko Haram under Buhari’s watch than at any time since the insurgency started in 2009. At least 500 soldiers have died this year alone. Yet, all that the government and its minions do is lie blatantly, shamelessly, and interminably about defeating Boko Haram. These dead soldiers are the sons, husbands, brothers, and cousins of humans like Buhari and us. A president who quickly ferried his son to Germany for world-class medical attention after he had an accident with a multi-million naira power bike couldn’t even as much as acknowledge the death of soldiers who died in defense of the land he leads until he was pressured and shamed into doing so. Yet he had the presence of mind to invite his incompetent service chiefs, whom he should have fired since last year if he was a sincere and competent leader, to grace his reelection campaign at the presidential villa. Amid this tragedy, a disturbing video is trending on social media of Nigerian soldiers on the frontlines complaining about their unpreparedness to fight Boko Haram. They show the viewer the military equipment they use, which they said were bought in 1983! Yet the government released one billion dollars for the purchase of ammunition. Asking soldiers to fight a well-armed, motivated, and nihilistic terrorist group like Boko Haram with equipment bought in 1983 is akin to sending them on a mass suicide mission. This is cruel and unconscionable! And it is precisely for this reason that Dasuki is still in jail. In Nigeria, sadly, the more things change, the more they remain the same.